Opencart Marketplace Blog module is easy to use and fairly handy to handle all your store’s posts. It enables the seller to add posts or blogs about products and manage them. The admin can see all blogs, comments and can delete them. Sellers can post for their product. Posts management from seller dashboard. fully management like edit and delete. Customers can view post using Tags, Category, Author, and can add comments. A view post links on every seller products. Admin manages blogs too if any thing is unacceptable can delete that. The seller can use category, Tags etc. This is a technology based era where everything is simplified even the online shopping. We all know about shopping apps and its advantages-how it reduces and makes our shopping experience hassle proof. So it is very important for all the Store owner to have a shopping app for providing more convenient way to shop from their online store and now Webkul’s has launched its new app Opencart Marketplace Mobile App. Opencart Marketplace Mobile App converts your marketplace store for Opencart into a mobile app. Your customers can easily purchase products on the go. They don’t need to have a laptop or desktop, they can easily explore your store through their smart phones. It will not only benefit the store owner and customer it will benefit the sellers too. Sellers can see their dashboard, order history through the mobile app. So what are you waiting for, you must now have an Opencart Marketplace Mobile App to be a step ahead. Installation of the module is very easy. You just need to drag your admin & catalog folder file into the Opencart root folder and it will be installed. You can also install the Opencart MarketplaceBlog module by uploading the admin & catalog files through extension installer. Admin have to install the XML file through the extension installer. Now admin will go to Extensions > Modifications and then click on refresh button like the image below. After that under extension->module menu install marketplace blog module. 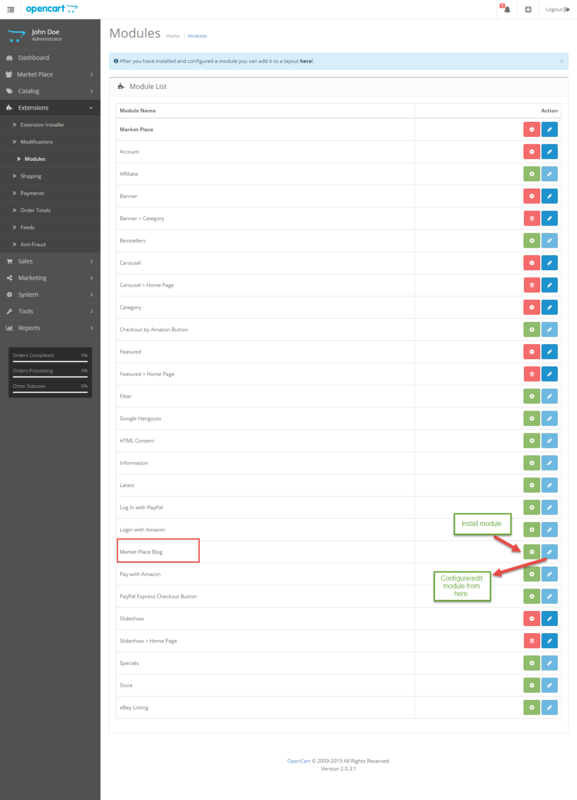 For editing the module, select your timezone and add pagination per page No. 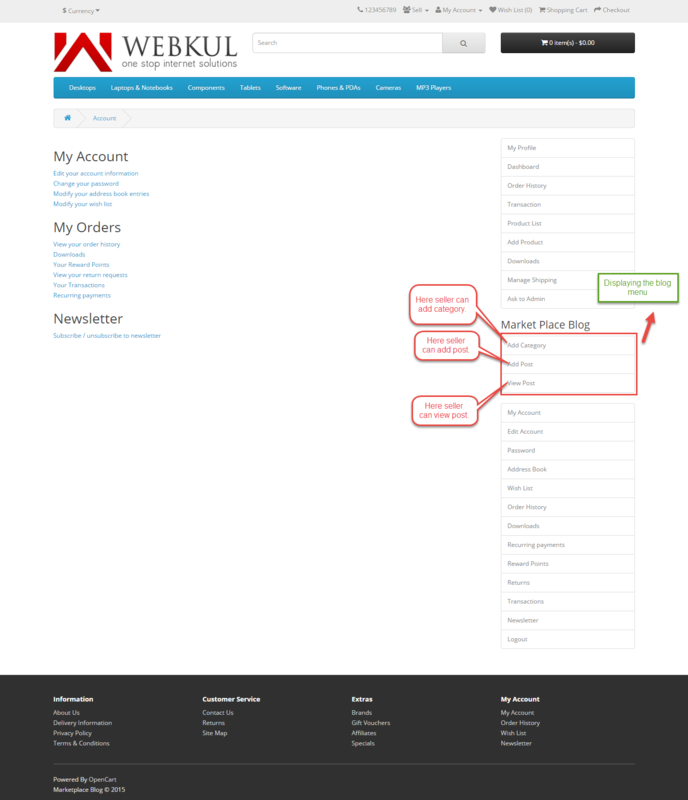 and add module to your account page and product page and save. 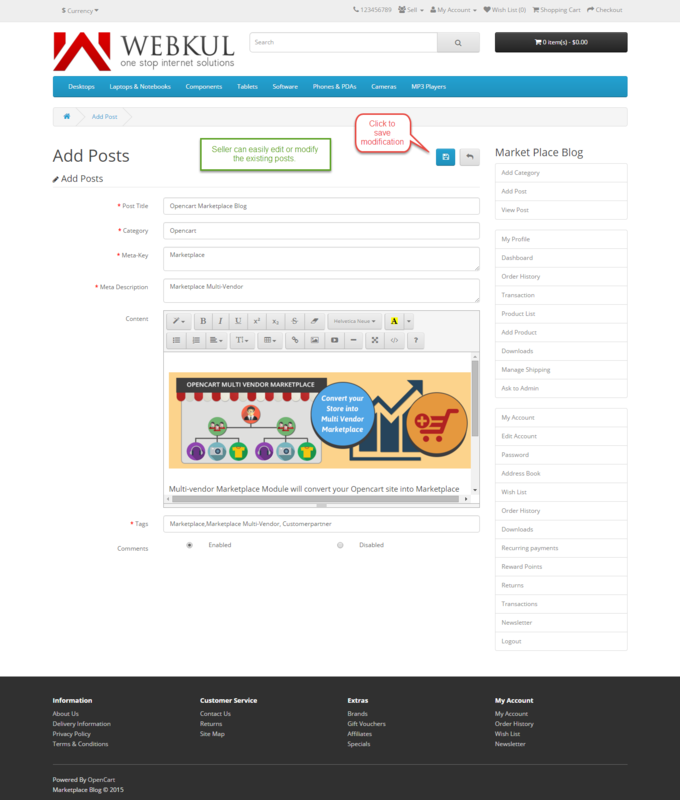 After this Market Place Blog box added to your my account page and using this seller can add the category and add posts and can view his/her all posts. After click on Add Category here seller add category for post. Here add after add category seller add post and use that category and fill these fields. Editing can be done easily you can refer to the below screen. This is normal customer and other users view. They can view post of a particular seller from the product page of that particular seller. 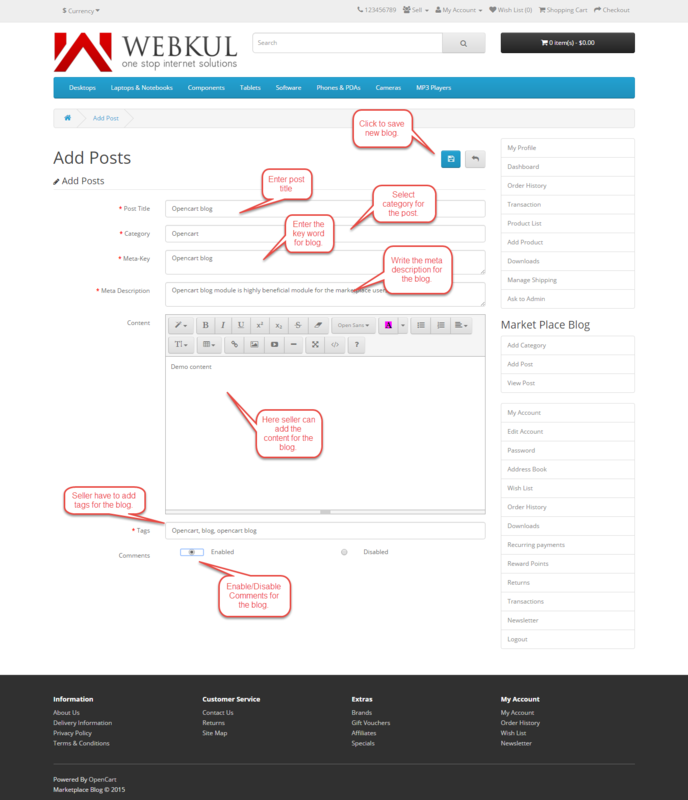 Admin panel view of blog menu. And in admin side admin manage Market place Blog,here admin can see all blogs and comments. Admin can view comments for a particular blog and admin can also delete comments.